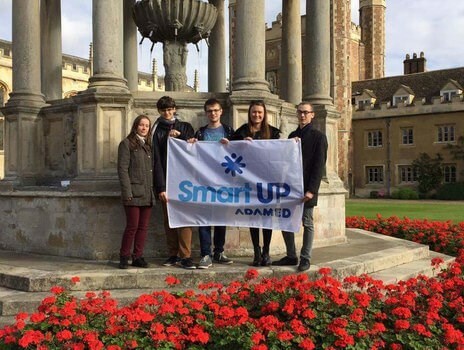 The first meeting of the ADAMED SmartUP programme alumni took place at the University of Cambridge. Its participants included the students of this prestigious university: Michał Bączyk, Marcin Bąk, Alicja Chaszczewicz, Paweł Piwek, and Anna Kosińska – the Programme Manager. The participants of the programme admitted that it offered them great support, especially in applying to universities – in their case helping them to become students at the University of Cambridge. “The programme assisted the young people in making their first steps to outstanding careers. The fact that they successfully use their potential both in Poland and abroad makes us doubly proud. They all share a passion for science and want to further their interests; that’s why we would like them to provide both motivation and support for other talented young scientists, so numerous in Poland,” asserted Anna Kosińska. Michał Bączyk and Paweł Piwek chose mathematics, Marcin Bąk chose engineering, and Alicja Chaszczewicz is studying computer science. In addition to the programme alumni present at the meeting, a student at the University of Cambridge is also Jakub Perlin – who was a participant of the 1st edition of the programme. During the meeting, its participants talked about their experience after their first weeks at the renowned university. They also presented their plans for the future, connected mostly with gaining valuable experience abroad, but also coming back to Poland. And what role did ADAMED SmartUP play in their scientific adventure? “It offered me great support, practically in all aspects, starting with educational support – tutoring and extracurricular activities which prepared me for the exams – but also support in the university application process. You should take part in the ADAMED SmartUP programme, because even if you fail and go out at some stage, I believe you will have good fun and gain interesting experiences anyway. I think ADAMED SmartUP changed my life,” says Michał Bączyk. All the participants agreed that the programme significantly helped them in furthering their passion for science and taking the next steps in their scientific careers.